I remember reading this back in the early 1980s. I probably checked it out from a public library no later than 1984, and I don't think it was brand new at the time. It was in hardback, in English, and I think there were references to recent strange events which apparently had been chronicled in full in a previous volume of the series. It was in a "kid's section" at the library; the area where they also kept such things as the Hardy Boys books or the Three Investigators books. I don't remember if this story was marked as "science fiction" or as "fantasy," but, as you will soon see, it had unrealistic plot elements which should qualify it as belonging within one or the other of those genres. I remember nothing about the author's name or the title. But I do recall the general plot pretty well. The main character is a kid who is part of a softball or baseball team in a town somewhere in the USA. I suspect he was no more than twelve years old at the time -- perhaps even younger. Possibly his team was part of the "Little League" program, but I can't recall if that exact phrase was ever used. I don't think the team was formally affiliated with a local school; nor were its rivals. Early on in the story, the main character somehow gets access to a supply of chemical solutions (or "magic potions," or whatever buzzwords were being used for this plot device). This stuff temporarily has an incredible energizing effect upon a human being. If you drink some of a certain liquid, you became significantly stronger and faster than you ever were before -- for the next few hours, at least. Then it wears off. To put it in superhero comic book terms, you don't become "Superman-level," but you are probably at the "Captain America-level." Suddenly you are the Perfect Athlete, maybe even a tad superhuman in how fast you can move, but you can't just punch right through a concrete wall, and you aren't impervious to injury. I think the protagonist used this super-chemical (or whatever) to "power up" at least himself and a friend, and possibly the entire team, before a few of their games. This helped them win, of course. Then there was another game coming up . . . and the protagonist was considering using the stuff again . . . but then he found out that, by special arrangement, the winners of this game would automatically play a game the following week against a team composed entirely of . . . wait for it . . . girls. This terrifying prospect forced the protagonist to rethink his plans. Clearly, the only thing to do was to let the other boys' team win the game, and thus they would be the ones who were ordered to do an exhibition match (or whatever it was called) against those girl athletes the following week! As I recall, the rest of his teammates were unanimous in endorsing this strategic decision that it was time to stop trying so hard. B) The stage where our protagonist's team had somehow been "energized" with that special chemical or potion, as a result of covert enemy action (i.e. the other team trying to power them up on the sly! ), and so they were all all fired up and scoring multiple runs. C) The stage where our protagonist had now "leveled the playing field" by spiking the drinks (just buckets of water, I'm pretty sure) of the rival team, to pay them back for doing the same to his people, so that now both sides were performing at "Captain America-level" as I call it, running around like greased lightning on the baseball field and hitting the ball very hard with their bats when the opportunity arose. In the end, there was a happy ending all around. ("Happy" being defined as "we will have nothing to do with a bunch of giggling girls!") The sponsor of the girls' team had dropped by to watch this game, or at least the last couple of innings of it, and right after the game ended, he said fervently that after what he had just seen, he had no intention of expecting those sweet kids on his team to play against such rough-and-ready hyperactive young males as were infesting both of these boys' teams, so he was calling the whole thing off! As you may have gathered, the whole story was fast-paced and amusing. Does anyone think it sounds familiar? I might like to reread it, and/or explore the author's other works, to see if they can still entertain me. It looks like this is The Homerun Trick, ninth book of the "Trick Series" by Scott Corbett where Kerby uses a chemistry set given to him by Mrs. Graymalkin (implied to be a witch). The formula may have been the same one used in the third book, The Baseball Trick. While the title is accurate in that this is a book about baseball, it also includes an old woman that is capable of performing magic. Her name is Mrs. Graymalkin and her mode of operation is the magic potion. When Kerby Maxwell and his friends are preparing to have a game against his archrival Red Blake, they are taken advantage of. The unwritten rules are that the players on the teams have to be boys from their respective neighborhoods and below a certain age. However, Red brings in some bigger, more powerful boys from elsewhere as ringers and so Kerby’s team looks to be in danger of being blown out. Therefore, he asks Mrs. Graymalkin for help and she tells him to mix two chemicals in the chemistry set that she gave him and then pour a certain amount into the water that his team will drink. The potion works and the boys that consume it are suddenly capable of amazing feats on the baseball diamond. However, things do not go entirely the way that Kerby wanted it, even though everything works out in the end. Kerby’s dog Waldo also emerges as something of a hero when it faces down a large and very intimidating dog after drinking the potion. 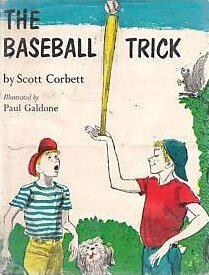 The combination of baseball and magic will delight young readers, even those that don’t really get excited about baseball. I think I read a few books in the series based on looking at the title, but I first found The Baseball Trick by searching for book baseball team "potions" on Google, and then adding search terms for "girls team", which revealed the later book. 90s/80s Cartoon with rebel helper robots resembling transformers? An anime (magical girl?) episode where they each have to play a different game but lose?